This post was sponsored by Snapfish, as always, all opinions are my own. Thank you for supporting the brands that support The Classic Brunette! Hello folks! As you are probably aware, it's graduation season! I've been getting all sorts of nostalgic lately due to my move and the fact that I graduated almost exactly a year ago. It's crazy thinking how fast this year went by, and even though I never left my college town, I still miss school, or at least the school atmosphere, so much! Whenever I hang out with my friends we always end up scrolling through our photos of our years together and pointing out the ones with our best memories. It's great that we can have all our memories with us at all times, but I personally am a fan of having more of a 'hardcopy' of photos as well. Back home, my parents created a closet full of photo albums. We had one for each year of our lives, all our special trips and memories, and it's still something I like to put together for myself or friends now and then. It's no surprise that college is one of those special events that I wanted to document, and I know it's not just me who feels this way! 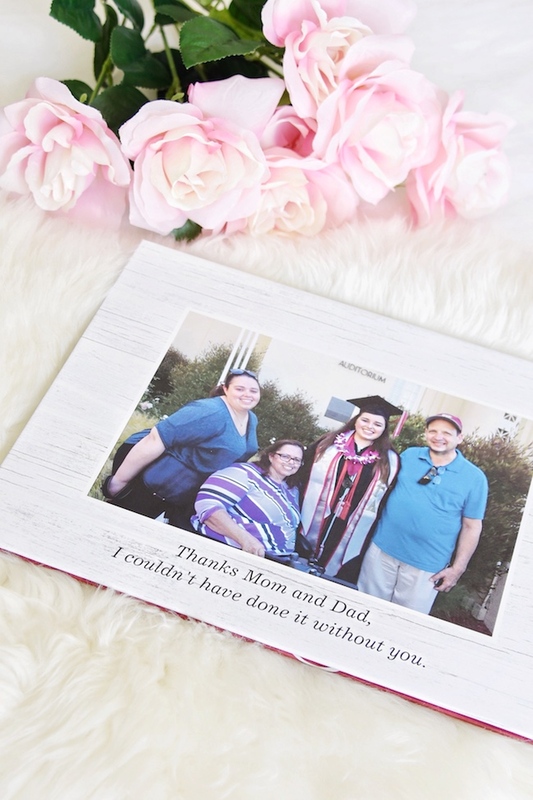 Graduation is the perfect time to start walking down memory lane, and creating some unique memory/photo themed gifts are the best way to set yourself apart from all the other friends and relatives. 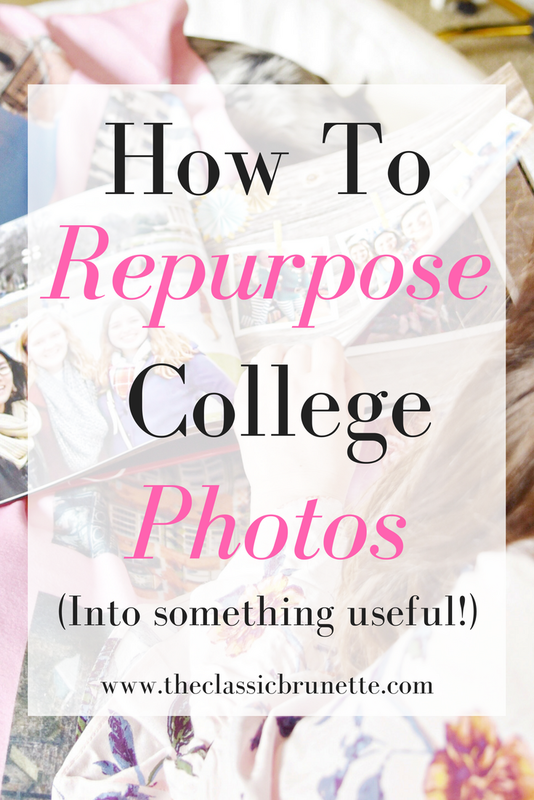 I'm partnering with Snapfish today to share my favorite ways to preserve your college (or any school) photos and leave your grad feeling happy and sentimental come their special day. One of the most unique items I found with Snapfish was their photo blankets! I've never thought to put your own pictures onto a blanket, something that I use constantly in my home. Snapfish has a number of premade designs, like my blanket above, however you also have the ability to make your own! They have designs for schools, vacations, graduation, etc, and you can mix and match elements to make your own unique design. I chose a template with space for 9 photos with some words in the center, but chose to add extra text and make it a way to save my photos from my various study abroad trips. I was beyond happy with how it turned out! I was worried that my photos wouldn't turn out clear since they were mostly taken with my iphone, or that it just wouldn't make a nice blanket, however the finished design is beautiful! Plus, Khaleesi wouldn't leave me alone while taking these photos, she thought the blanket was the comfiest thing around! For reference, this is the Arctic Fleece Photo Blanket which, although relatively thin, provides a great amount of warmth, and it's a great size. I love this idea for grads, especially those who have been in some sort of extra curricular or done a study abroad. It's a great way to focus on a specific aspect of your school that you're proud of, loved, or just don't have enough to fill an album with, ha! I chose my study abroad trips because they were such a special part of my college career and each one changed my path so much. They deserved to have their own dedication! However I think a greek organization, a club or honor society, or a sport would make great photo blankets as well. 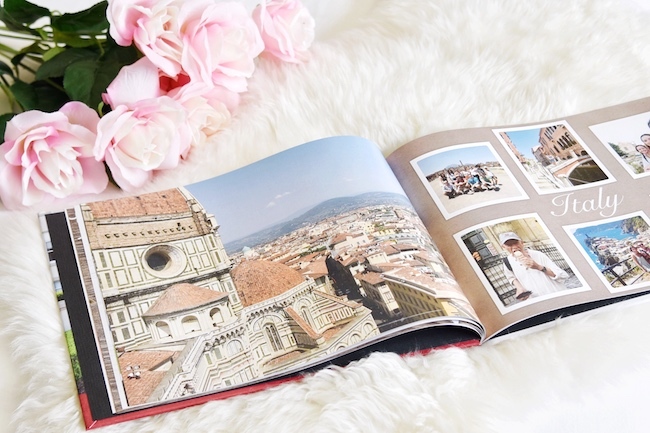 If you want something a little more traditional, a photo album ALWAYS makes a great gift. In my opinion it's the best way to save your photos into something tangible that you can reach for when you're feeling nostalgic. When I'm back at my house, I always end up looking through our old photo books. Something about them makes me so happy and give those photos an extra special place in my heart. 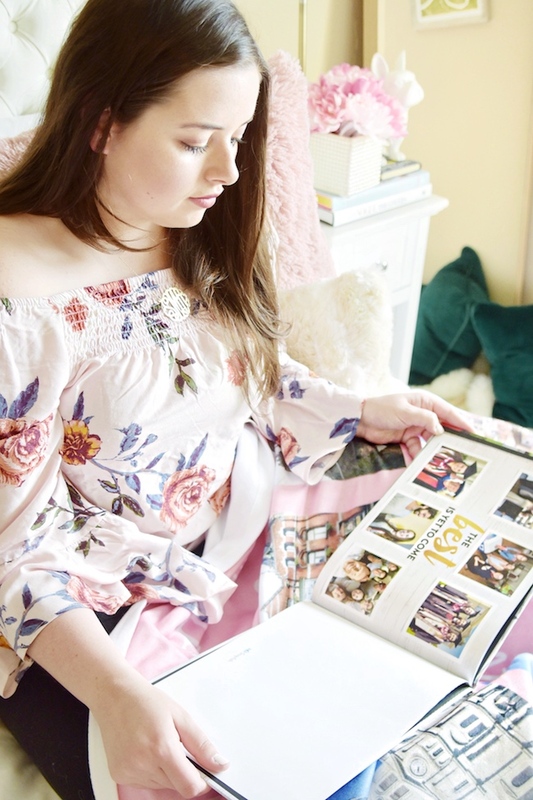 I chose to make my own college photo book to keep my memories alive and have already gone through it with friends and relatives. It's so much fun to go through, even after just making it! I also had a ton of fun personalizing the book with different designs and layouts (I got so into it that I actually spent a full day designing mine!) and making each page unique to different parts of my college life. 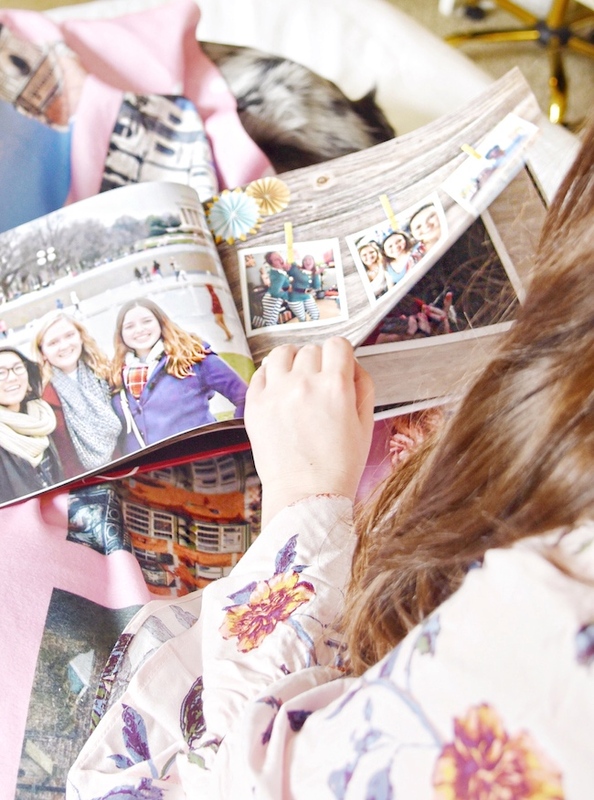 Although I had already made the blanket with my travel photos, I wanted to include them in my photo book as well, because as anyone who has traveled knows, you always take WAY too many photos! P.S. Check out the candid of my professor eating gelato in Rome above, ha! As I said, Snapfish has a number of personalized elements to decide on when creating your photo book, and I was so happy to find a "The best is yet to come" sticker! That was actually what I put on my grad cap, so having that at the end of my book was the perfect way to finish it off. I absolutely loved how my photo book looked, and of course had to find a way to include my parents in it for everything they did for me. It makes me happy that I have this little reminder of all their love and support for me over those four years, even if it does make me tear up a bit when looking at that photo of all of us together. This book was also absurdly easy to make. I was worried I would struggle with creating it, but the process was super simple! Similar to the blankets, there are a bunch of templates that you can choose from when making your album. Each one has a different theme, and you can even let Snapfish add in their own decorations that match with the theme. It's as easy as uploading your photos (which, by the way was so quick and simple), choosing your theme, adding your photos (or letting Snapfish assign them a spot randomly), and adding the text you want! I decided to take a little creative liberty by creating my own layouts and not sticking to a pre-made theme, or at least for the most part. I did keep a few elements from the theme I chose just because it was perfectly designed! Now lucky for you all, Snapfish is offering everyone who reads this 40% off their order just in time for graduation! 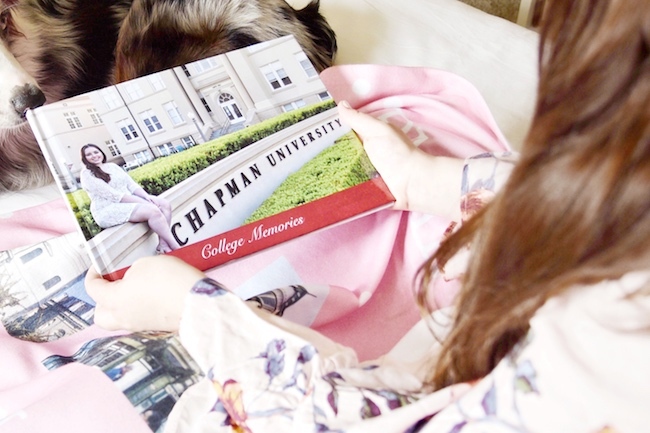 Whether you're making a unique keepsake for that special grad in your life, or you're the grad, this is the perfect time to make a personalized photo memory. Although I only talked about their photo books and blankets, the site offers a huge variety of items including pillows, canvas prints, mugs, stationary, and more! Use the code YAYGRAD to get that awesome 40% discount! What would you make a photo book of? 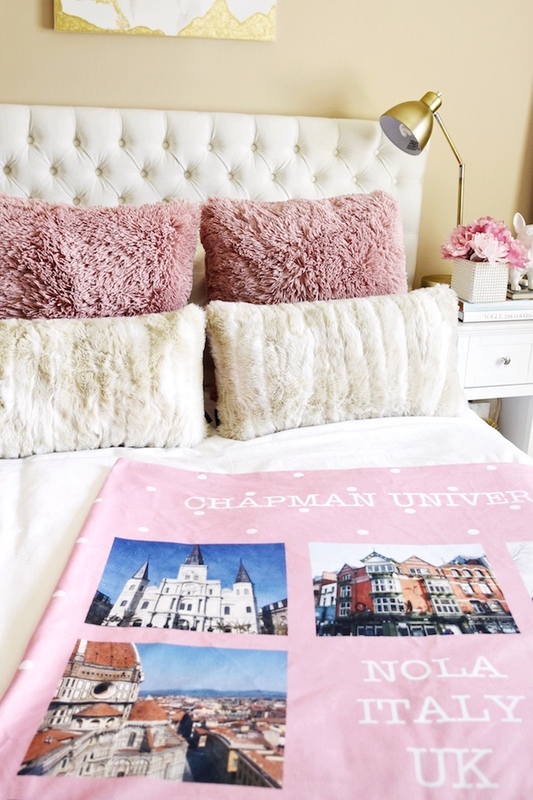 LOVE the idea of making a photo blanket - how cute and cozy. That's perfect to have to remember all the college memories! Isn't it such a cool idea! It's also just such a nice blanket, can never have enough of those! My next step is to actually make a t-shirt quilt! I have so many shirts that are just sitting around! I'd love to see your scrapbooks when you're done! Oh what a great idea of making a blanket!! That's genius! Right? Isn't it such a cool idea, so unique! This is amazing! I never thought of doing this! This is such a sweet gift and to be able to wrap yourself up with your favorite memories is so cute! You dog is adorable by the way! I love having more personalized gifts, they're the best! And thank you! She actually belongs to my roommate, but I spend so much time with her that I consider her my own! 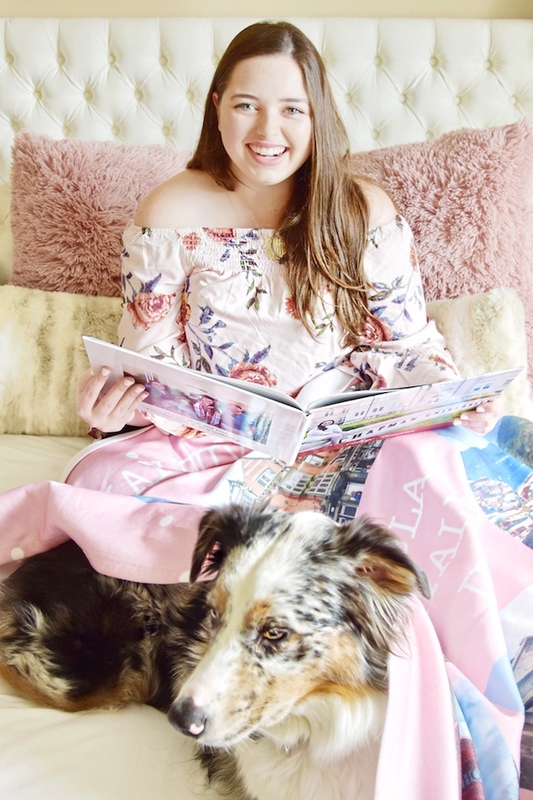 The photo album is definitely a favorite, but I absolutely love that blanket! 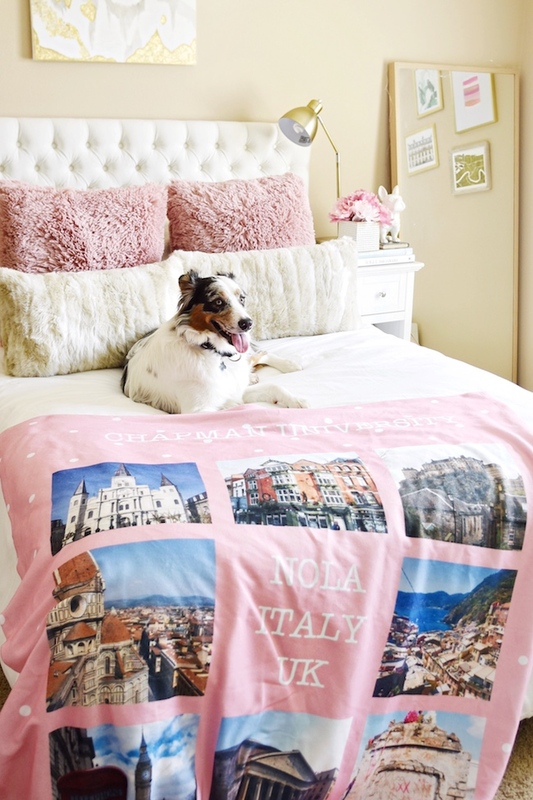 Way cuter than other photo blankets I have seen. I'll have to try out Snapfish soon! These are all such beautiful gifts that don't have to only relate to graduating! I'd honestly love a photo blanket and/or album for every holiday that I go on. I'm a big photo taker, hah! I really enjoyed reading your post about how to keep the memories of college years intact. I know there are mugs or t-shirts with photos on them, but never thought about blankets. Think it's a very original idea (as I haven't heard of it yet) and you'll have more space to add your photos, haha! That blanket is so cute! I love making photo books! I have one for each trip abroad I've done. It's a great way to ensure photos don't just get lost on your computer or phone. 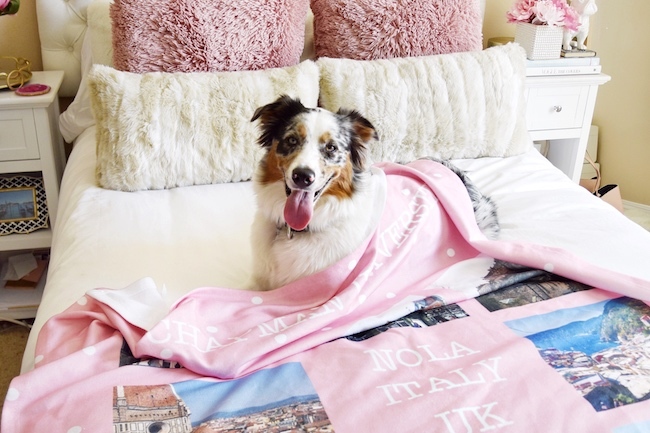 Oh, that's such a cute idea, I've never seen a photo blanket before! I'm thinking of getting a photo album and this one is really cute! Haha that candid totally got me! I love the ideas of preserving your memories though a blanket, it’s fun and so nice! That photo blanket is SO different and beautiful! I love this - yours came out so great!! the photo blanket is too cool!! That photo book is beautiful! I want to make one now!